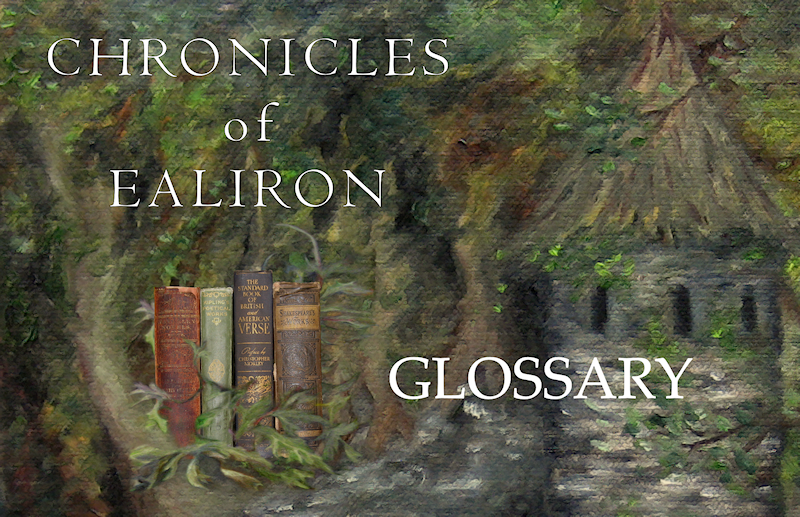 Welcome to the Glossary for the Chronicles of Ealiron series, including links to maps, illustrations and relevant posts. Aenmos (EN mohs): In Aenspeak, “creator.” Cast in the male sense. Used as a formal title and address for Ealiron, or for any Formation entity. See also Ealiron, Formation entity. Aenlisarfon (en LIS arvon): A council of nine wizards of the Order of Raven who watch over the patterns of human and immortal energies in the higher spheres of consciousness that permeate the world of Ealiron. See also Keepers of the Eye. Aenspeak (EN speak): An ancient language used by wizards to invoke and focus power. Comes from the word aen, which roughly means, “the primary fire” or “the source of sound.” Aenspeak is informally referred to as the wizard’s tongue, and is a higher, more structured form of the Dark Tongue, which is differentiated from it. See also Dark Tongue. Aesfoth (AS foth): The ruling seat of Faerin. Named after a constellation present in the winter sky over the northern hemisphere of Ealiron. See map: Ealiron: Sourcesee and West. Albatross: A Keeper of the Crafts trained in the arts of seafaring. Holds limited powers of the Eye pertaining to working weather and elemental forces. See also Keepers of the Eye, Keepers of the Crafts. Apparition: A perceivable thoughtform consciously created from a wizard’s essence to perform a certain task. Apparitions are able to pass between dimensions of consciousness, including the physical. Archer Falls: Colloquial name given to the high cliffs on either side of Os, which are manned by archers who guard the shores. See also Os. Ascarion (as CARE ee un): An ancient war god worshipped on Tromb, in the Gray Isles. See also Gray Isles, Tromb. 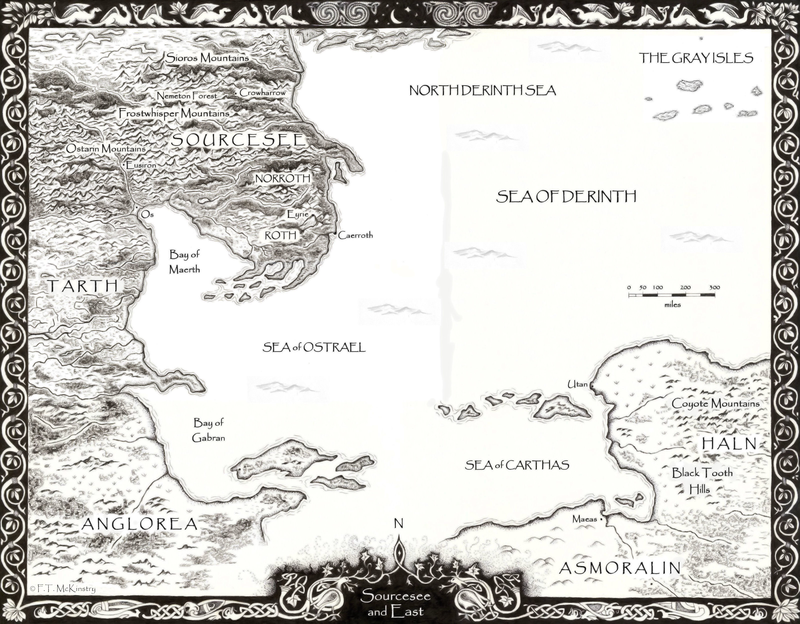 Asmoralin (as MOR ah lin): A large, rugged, arid realm southeast of Sourcesee. 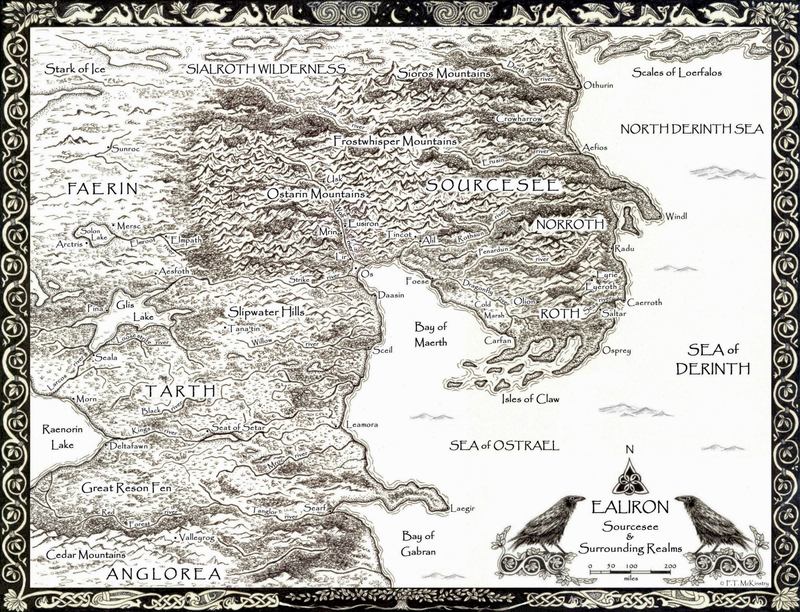 See map: Ealiron: Sourcesee and East. Aspect: A self-aware portion of an entity’s essence, focused on the time-space matrix to express that part of the entity’s nature. Aspects are a part of the creator, yet also possess individuality and free will, including living things such as humans, animals, plants, trees, and immortal creatures such as sioros and loerfalos. 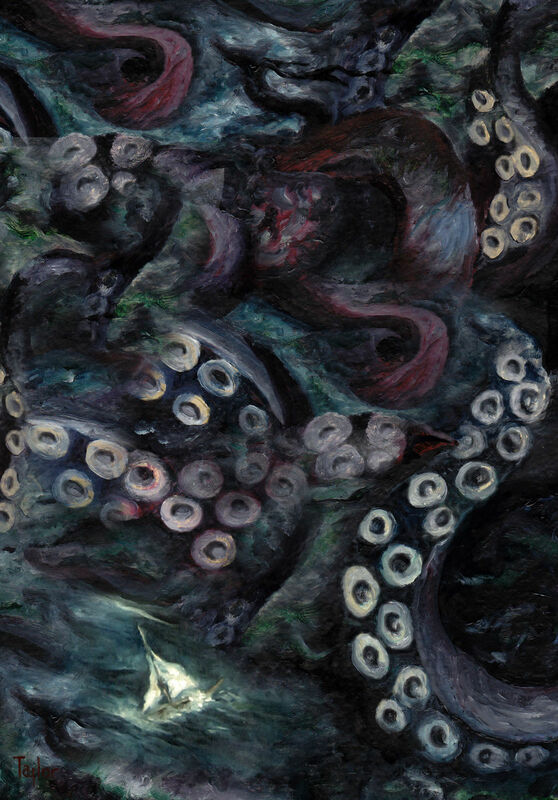 Term also refers to the perceivable manifestations of the Old One, such as the Destroyer. See also Entity, Old One. Blackring: A permanent injunction by the Aenmos that renders a wizard of the Order of Raven unable to focus energy in certain patterns and frequencies beyond the mortal spectrum, thus making those powers latent. Black Tooth Hills: A rugged mountain range in the south of Haln. See map: Ealiron: Sourcesee and East. Breasin felos oth: In Aenspeak, “May starlight shine.” A greeting. Refers to the position of the stars during one’s birth. Carmaenos (car MAIN ohs): An entity. Started a war in the ancient history of the Gray Isles. See also Entity, Gray Isles, oborom. Circle: An order of priestesses in the ancient civilization of Tromb who worshipped the Old One. Symbol is a black circle of leaves surrounding a serpent entwined in the shape of a triangular knot with a shining star in the center. See also Old One, Tromb. Crowharrow: A village in the Forest of Loralin. Named after a legendary immortal creature that goes by the same name in local folklore. See also sioros. See map: Ealiron: Sourcesee. Darkeye: A circle of square stones used to mark a naturally occurring area of formlessness in the earth. Can be used to hide things on the time-space matrix, or to scry for information. See also Time-space matrix. Darkstar: A title for a Keeper of the Eye of the Order of Osprey who is studying for the Order of Raven. Standard contains a black, interwoven hexagram that shadows the symbol of Osprey. Dark Tongue: The language of the Old One, of formlessness; primary sound that emerges from Void and is used to affect things at the most basic levels. See also Aenspeak, Old One. Destroyer: The darkest aspect of the Old One. The force of death, transformation and change. Sometimes appears as a black cloaked figure, or a wolf. See also Old One. See posts: Where Veils are Thin and Ealiron Glossary Terms: The Old One. Ealiron (ee ah LEER un): First Formation entity in the Pentacle of Eaon. Creator of the world. Also called the Source, or Aenmos. See also Aenmos, Formation entity. eamoire (EE ah mwaar): In Aenspeak, “earth shaper.” The offspring of an immortal creature and a god. Passes between its natural state and that of a human, usually to mate. Rare, due to the inherent difficulty in transforming between Otherworld and human shapes. Eaon (EE on): A Formation entity and the creator of Ealiron and Eusiron. See also Formation entity. Elemental summoning: The ability to use Aenspeak to invoke the forces of water, earth, air or fire in order to affect physical events. Energy shield: A pattern of energy used by wizards to cloak or alter their or another’s physical appearance, emotions or impressions. Entity: The multidimensional aspect of a human soul, a greater essence or consciousness that encompasses all the personalities of its expression, which are assumed to exist simultaneously; that is, beyond the time-space matrix. See also Formation entity, Time-space matrix. Essence Return: A command that focuses something into its most basic elements. Can only be spoken in the Dark Tongue. See also Dark Tongue. Etherweed: A plant, the roots of which can render a wizard powerless by separating him or her from the source of mental focus. Eusiron (ee yew SHY run): Fourth Formation entity in the Pentacle of Eaon. A war god referred to as the Dark Warrior and said to have built the palace of Eusiron, which is named after him. Palace is located in western Sourcesee and overlooks the Wolf River; standard is a circle with a wolf in the center, a river beneath and mountains above crowned by the constellation of Laerstroc. See also Formation entity, Laerstroc, Maelgwn. 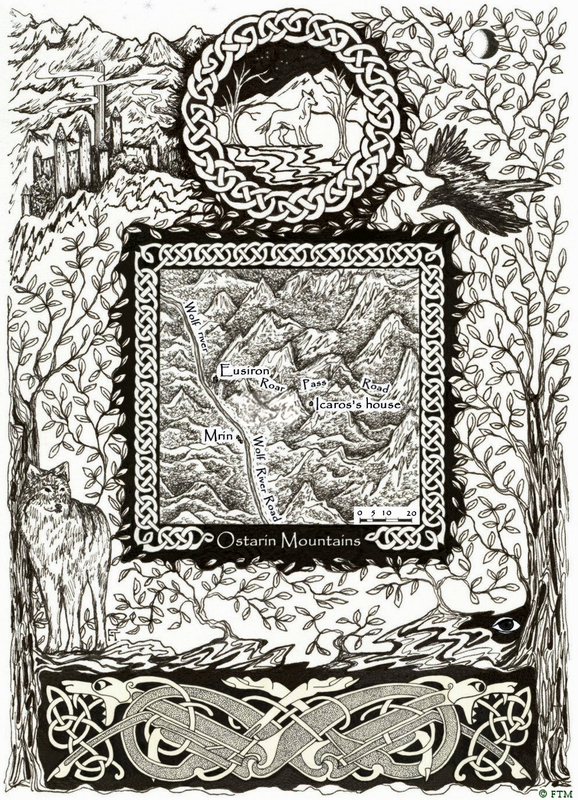 See maps: Ealiron: Sourcesee and West, Ostarin Mountains. Eusiron’s Haunt: A dense, uncanny wooded area south of the palace of Eusiron, rumored to be directly focused and controlled by the god himself. Eyrie (EYE ree): The seat of the Keepers of the Eye and home of Ealiron. Contains a Waeltower that focuses the Source. Standard is an eye in the center of a dark circle, surrounded by the shining rays of a sun. Located in the land of Roth, in eastern Sourcesee. See also Ealiron, Source, Waeltower. See map: Ealiron: Sourcesee. Falistrom: A rare and poisonous herb used to heal a broken heart. Faerin (fay AIR in): A war-torn realm west of Sourcesee. Standard is dark brown with red hills outlined by gray, with a single sword pointing down in the center. See map: Ealiron: Sourcesee and West. Faerin net: A complex military formation designed to guard against enemy infiltration of a sensitive or closely held place or thing. fiorloc (vee YOR lok): In Aenspeak, “spider’s web.” A skill used by wizards to perceive and manipulate the intricate web of energy that interconnects the natural world. First One: An immortal aspect created by a union between the Old One and an entity named Om. See also Aspect, Entity, Old One. folciel (VOLE seeil) sphere: An opaque, evergreen stone that opens a portal between the consciousness of its user and the forces of the sea. An object of the Otherworld, the sphere focuses above the time-space matrix and is therefore difficult to control and understand. Traditionally used only by Keepers of the Eye. See also Keepers of the Eye, Time-space matrix. Formation entity: A divine being that creates the basic structures that comprise physical reality. Formation entities are interconnected by energy that flows within an infinitely complex network that sustains all life. See also Entity. Graestrip: A poison distilled from a shellfish of that name. Uses an ancient form of sorcery that distorts physically focused consciousness with alternate probabilities. See also Probability. Gray Isles: A remote archipelago roughly a thousand miles northeast of Sourcesee. See map: The Gray Isles. Grid: Informal. See Time-space matrix. 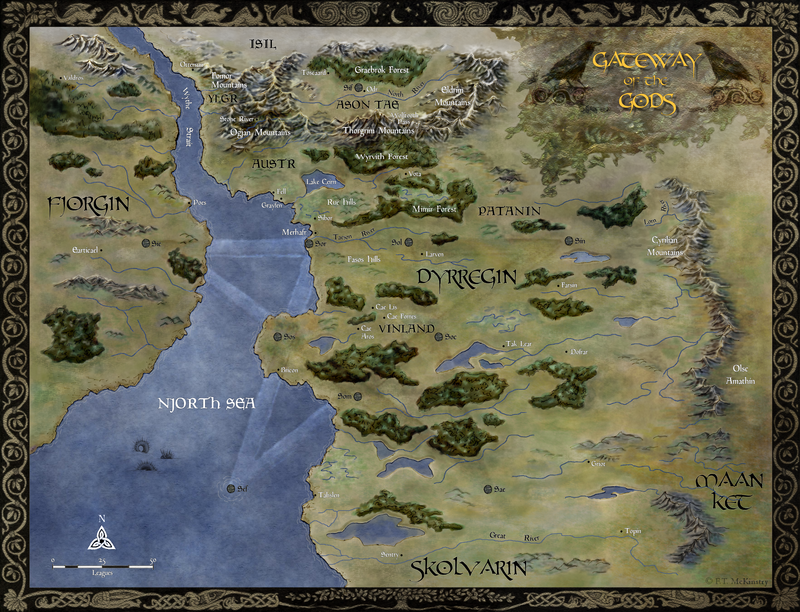 Haln: A realm bordering Asmoralin, the Sea of Carthas and the Sea of Derinth. See map: Sourcesee and East. High Dark: A priest of Maern chosen by a circle of high priestesses for being the most aware of and able to understand the nature of the Old One’s domain. See also Maern, Old One. High wizard: Informal. Refers to wizards in the Orders of Owl, Eagle, Osprey and Raven, the highest four orders of the Keepers of the Eye. See also Keepers of the Eye. Hunter’s Rede: An unwritten set of instinctual codes called Shades by which assassins practice their trade. See post: Shades of Instinct. Hunter’s Sanctuary: an establishment where assassins can go for shelter and protection, and in which the Shades of the Hunter’s Rede are recognized and upheld. Identity mark: A set of runes engraved into a sword that binds the heart of a warrior to his or her source entity. See also Entity. Interdimensional portal: A highly advanced command used by wizards to create a rift in time-space without altering dimensions. Invoked using the Dark Tongue, which changes the structure of perceivable reality as it emerges from formlessness. See also Dark Tongue. iomor (EE oh mor): In the Dark Tongue, “light well.” A well of energy fixed in a specific area of the earth; the exteriorized essence of the entity of that particular realm focused as a pure energy source. The Masters of the Eye focus the energy of the iomors using Waeltowers. See also Entity, Master of the Eye, Waeltower. Keepers of the Crafts: A group of orders in the Keepers of the Eye with specific powers pertaining to the following: Wren (healers), Albatross (sailors), and Raptor (warriors). See also Albatross, Keepers of the Eye, Raptor, Wren. See also High wizard, Keepers of the Crafts, Parallel focus. See post: Ealiron: Keepers of the Eye. Laerstroc (layer STROKE): A constellation that appears directly over the palace of Eusiron on the night of the winter solstice. Said to be the celestial home of the war god Eusiron. See also Eusiron. Lea Maern silin moth: In Aenspeak, “Mother is whole.” Words of power used to restore balance by invoking the Old One in wholeness. Can also be interpreted as “Mother is one,” or “Mother is all.” The phrase has many shades of meaning, all of which describe the unity of the Old One’s aspects as they truly are, as opposed to how mortals perceive them. See also Old One. loerfalos (lo ER vah los): In Aenspeak, “serpent of green darkness.” A very large, immortal dragon-like creature that lives in the northern seas. A First One. Always female. See also First One. Loralin: A large forest located between the Derth and Erusin Rivers, northeast of the Frostwhisper Mountains, in Sourcesee. See map: Ealiron: Sourcesee. Lucid dreaming: The ability to become conscious and aware during a dream, and to influence it. Maern (MAYrn): In Aenspeak, “mother.” See Old One. Maelgwn (may EL gwin): An elusive, black-haired race of the Ostarin Mountains who are accomplished hunters, trackers, builders and stoneworkers. Tales claim they were created by Eusiron, and are beloved of him. See also Eusiron. Master of the Eye: A title that refers to a wizard in the Order of Raven, the highest order of the Keepers of the Eye. See also High wizard, Keepers of the Eye. Menscefaros: (men SCEV are ohs): In the Dark Tongue, “nameless one.” A term used mostly by immortals to refer to the Old One. Virtually unknown and unpronounceable by mortals. See also Old One. 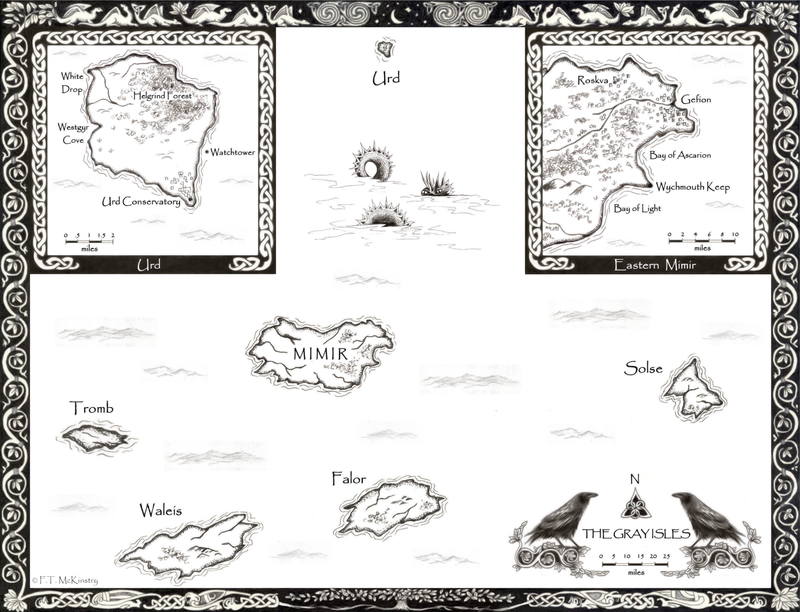 Mimir: The largest island and ruling seat of the Gray Isles. Home to the beryl Waeltower of Mimir, in Wychmouth. See also Gray Isles, Waeltower. 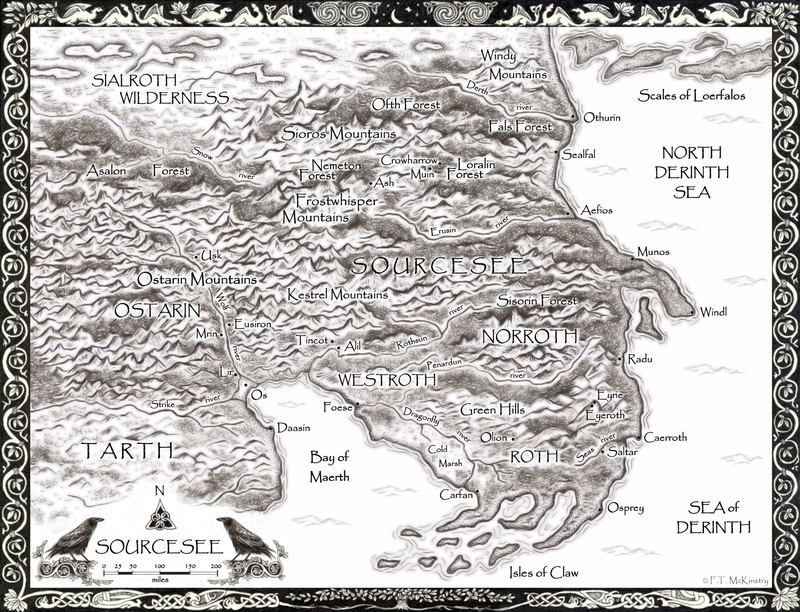 See map: Ealiron: The Gray Isles. Mindkey: A skill practiced by wizards that opens gates and locks through the awareness of structures and energy fields. Mindspeak: Telepathy. Using the mind and thoughts to communicate with another through a conscious connection to that person. Moridrun fore sarumn: In Aenspeak, “unveil essence to light.” Power words that reveal the true nature of something. Used by wizards to see through spells, energy shields, illusions, etc. See also Energy shield. Motherblack: A rare, difficult to make and very powerful potion that brings one just beneath the threshold of consciousness and Void, rendering one unable to express physical reality, or to discern between impressions and actual perception. Renders the recipient completely opaque to any kind of vision or magic, including that which invokes the Old One. Effects of motherblack can be undone with the essences of blackthorn and thistle. mothos: In the Dark Tongue, “protector.” A talisman in the shape of a pentacle interwoven with ivy and thistle surrounded by a circle of leafy ash branches. Either worn or carved onto a surface such as a wall, it provides a portal to the Old One that detects imbalance in its vicinity. See also Dark Tongue, Old One. Muin (MOO in): A hall in the heart of Loralin Forest, near the village of Crowharrow. Standard is vine with red grapes twined into the shape of an interlocking pentacle with a rose-yellow sun shining in the center. Contains a Waeltower, and is a Sun key. See also Crowharrow, Sun key, Waeltower. oborom (OH bor ohm): “Shadow god,” in an ancient dialect spoken in the Gray Isles. An order of warlocks who serve the Riven God. See also Gray Isles, Riven God. Oculus (AW kew lus): The Waeltower of Eyrie, the seat of the Keepers of the Eye. Located on Mount Rothmar, in the center of the Keepers’ citadel. Constructed of amethyst, with eight sides, the Oculus focuses the Source, the iomor that aligns the forces of the elements to the will of Ealiron such that he is aware of and focused in the physical origin of his expression. Often referred to by wizards as the “Amethyst Waeltower.” See also Ealiron, iomor, Keepers of the Eye, Source, Waeltower. ofsinae (AWV sin ay): In Aenspeak, “lens of the gods.” A stone circle containing a crystal pentacle and six statues of the entities in the Formation of Ealiron. Each statue stands on one point of the star, wears the characteristic garb of the god and holds a talisman, as follows: Ealiron, in the center, holds an amethyst orb; Bancor, a branch; Math, a sword; Aorin, a crow; Farus, a bow and quiver; and Maelin, a cup. The ofsinaes are in remote, often inaccessible areas and are used to summon the Creators of Ealiron. See also Aenmos, Ealiron, Formation entity. Ofthos (AWV thohs): In the Dark Tongue, “gate of light.” A circular area in the center of the Great Hall of Eusiron that serves as a gateway or portal to energies created by the alignments of the earth, sun, moon and stars. Most often used in celebrations of solstices and equinoxes. See also Eusiron. Old One: The primordial goddess of nature, life, death, and transformation. Formlessness, Void. Often referred to as Maern, Aenspeak for “mother.” Unknowable in her true form, but perceived by all structural consciousness in terms of feminine aspects: e.g., maiden, mother, crone. See also Destroyer. See post: Ealiron Glossary Terms: The Old One. Om tree: An ancient tree of unknown origin, seeded by the stars and rooted deeply into the iomor beneath the palace of Eusiron. Located in the Omefalon, the tree is said to have great knowledge of the Old One, can tell truth from lies and see into the hearts of mortals. See also iomor, Old One, Omefalon. See short story: The Om Tree. Omefalon (oh ME valon): In the Dark Tongue, “holding root and sky.” A large chamber in the palace of Eusiron that houses the Om tree. Designed to allow the tree to stand in the elements, or to be enclosed, depending on the circumstance. See also Eusiron, Om tree. Os (OHS): In Aenspeak, “between earth and sky.” A large port on the northwestern curve of the Bay of Maerth. Contains a topaz Waeltower with seven sides. Also called the City of Hallow Rivers. See also Waeltower. See map: City of Hallow Rivers. Os City Guard: Warriors who guard and keep order in the city of Os. Standard is a wave of green and gray, and contains the three-river triangle with a sword and arrow crossed over it and a seagull flying upwards over the top. Ostarin (oh STAR in): A wooded, mountainous realm in western Sourcesee. See map: Ealiron: Sourcesee and West. Parallel focus: The mortal child of a god. Focused as a human, but also incipient as an entity who will be born above the time-space matrix. Parallel focused mortals are trained as wizards and prepared through the Order of Dove for ascension. See also Entity, Keepers of the Eye, Time-space matrix. Probability: Extensions or lines of time projected out from any present moment to include all possible combinations of events that fulfill an identity’s desire at that moment. Raptor: A Keeper of the Crafts trained in the arts of war. Holds limited powers of the Eye pertaining to the focus and use of weapons. See also Keepers of the Eye, Keepers of the Crafts. Rastric: A deadly spider that inhabits the Tarthian jungles. Lives only in the swamps that feed the headwaters of the Mroc River. Saltar: an outpost in the forest of Roth in southern Sourcesee used to hold prisoners of war. Sceil (SHEEL): A port on the Bay of Maerth, on the mouth of the Willow River. Searf (SARV): A port on the Bay of Gabran, in southern Tarth. Seat mor streac Maern: In Aenspeak, “By the Mother.” Used as an oath. Shade: A code or principle in the Hunter’s Rede. See also Hunter’s Rede. See post: Shades of Instinct. Shapeshifting: The art of changing one’s shape into something other than human; for example, a bird or other animal, a tree, fog, etc. Sialroth (shall ROTH): A large wilderness area in northern Sourcesee. Silin en Maern tali: In Aenspeak, “Blessed is the Mother.” A blessing, used mostly by wizards and followers of the Old One. Cannot be uttered with any kind of deception. siomothct (she om OCH): In the Dark Tongue, “destroyer’s eye.” An assassin in service to the Keepers of the Eye. Must belong to the Order of Raven. Rank is referred to as Regard, first being highest, third being lowest, according to skill and experience. See also Dark Tongue, Keepers of the Eye. sioros (she OR os): In the Dark Tongue, “destroyer in the air.” A rare immortal creature with the body of a man and the wings of a bird. Predatory and very dangerous, lives in the far northern wilderness areas of Sourcesee. See also Crowharrow. See post: Monsters and Gardening. solsaefil (sol ZAY uh vil): See Sun key. Source: The focused energy of Ealiron. An extensive and very potent iomor located beneath the Waeltower of Eyrie. Connects, feeds and contains all of the iomors in Ealiron. See also Ealiron, iomor, Waeltower. Sourcesee: A northern mountainous realm and the center of power for the Keepers of the Eye. See also Keepers of the Eye. See map: Ealiron: Sourcesee. Sun key: In Aenspeak, solsaefil. An architectural construct that uses a Waeltower to direct the light of the sun into geometric patterns that illuminate physical locations. Designed to mark seasonal events such as solstices and equinoxes. See also Waeltower. 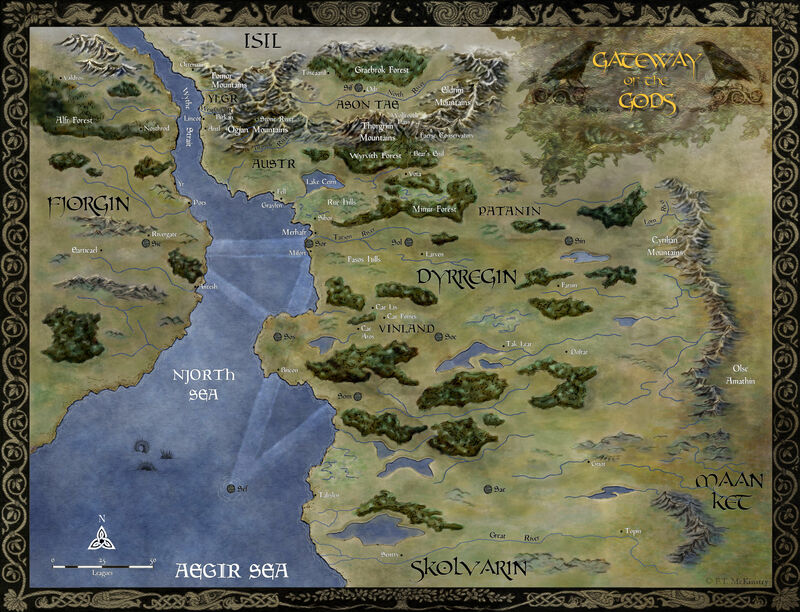 Tarth: A great, watery realm south of Sourcesee comprising mostly swamps, rivers, lakes, wetlands and jungles. See map: Ealiron: Sourcesee and West. Treecloak: An energy shield cast by an entity over some area of the earth. Refers to the shade beneath the leafy boughs of a tree. See also Energy shield, Entity. Tromb: The westernmost island in the Gray Isles. See also Gray Isles. Tromblast Keep: Ruling seat of Tromb, westernmost island in the Gray Isles. Keep has four towers aligned with the winds’ directions; traditionally, four princes called Sentinels are born to represent the towers. Underrift: A powerful, dangerous Dark Tongue command that breaks one’s conscious connection to the time-space matrix by summoning the forces that place one there. See also Dark Tongue, Time-space matrix. Undersides: a tangled network of alleys, caverns and slums in the lower reaches of the port city of Os. See also Os. Voidstone: An amulet made of black-green stone of unknown source or origin, as it is formless; i.e., invisible on the time-space matrix. Can be brought between dimensions. Given by the Old One to those she chooses, or by those who serve her. A sioros voidstone is used to enter the presence of the goddess herself. See also Old One, sioros, Time-space matrix. Waeltower: Based on the word wael, Aenspeak for “focus.” An architectural construct built over an iomor, used by the Masters of the Eye to channel and focus energy. Built as a tower with concentric levels, including a floor containing a pentacle with the Eye in the center, a ceiling with a crystal star of a specific number of points, and a spire above that, made of a crystalline substance with a corresponding vibration, and containing the same number of sides as points in the ceiling star. The geometry and composition of each Waeltower varies according to where on the planet it is. See also iomor, Oculus, Source. Watch-web: A skill used by wizards to spread the mind into a surrounding area. Used to detect the presence of anyone nearby. Web: Refers to someone whom the Old One has chosen to provide openings in the time-space matrix through which she can be perceived. Webs are rare and tend to land in positions of power or influence, where the Old One can express her will directly in terms of mortal events. See also Old One. Wizard’s Code: A code of ethics by which the Keepers of the Eye abide. Includes the Law of Free Will, the force of expression by which all things experience their nature through life in form on the time-space matrix. Governed by the Old One and known in all its permutations and combinations only by her. See also Keepers of the Eye, Old One. Wren: A Keeper of the Crafts trained in the arts of healing. Skilled in the cultivation and use of root, leaf, seed and bark. Holds limited powers of the Eye pertaining to energies in the body. See also Keepers of the Eye, Keepers of the Crafts. © F.T. 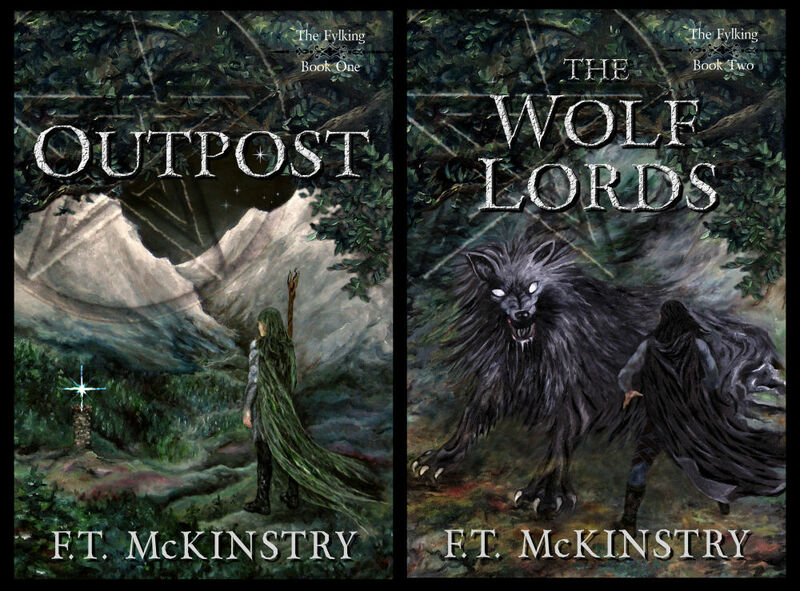 McKinstry 2014. All Rights Reserved.